lt;stronggt;SAF5239BLlt;/stronggt;lt;BR/gt;Safco Scoot Mail Cartlt;BR/gt;All-steel construction with modern styling. Convenient handle and side storage pocket. Top basket holds legal size folders. Bottom shelf with lip holds packages and supplies. Front swivel casters and oversized rear wheels for effortless movement around the office. Color: Black/Silver Capacity Weight: 300 lbs. Caster/Glide/Wheel: Two 3amp;quot; Front Swivel Casters, Two 8amp;quot; Oversized Rear Wheels.lt;BR/gt;lt;BR/gt;lt;stronggt;SAF7751GRlt;/stronggt;lt;BR/gt;Safco Scoot Mail Cartlt;BR/gt;Extra-wide, 11amp;quot; mail trays form any combination of compartments up to 25. Can be used stand-alone or stacked. 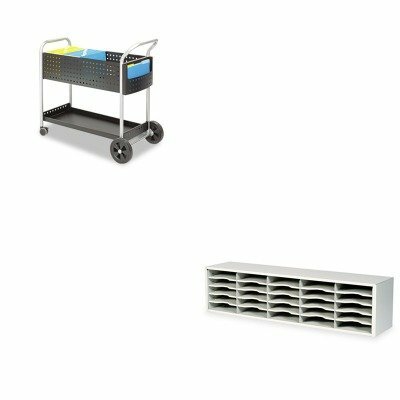 Includes 20 molded compartment trays, each with finger cutouts and label holders. Shelves adjust in 7/8amp;quot; increments. Literature Sorter Type: Open Front Mail Number of Compartments: 25.